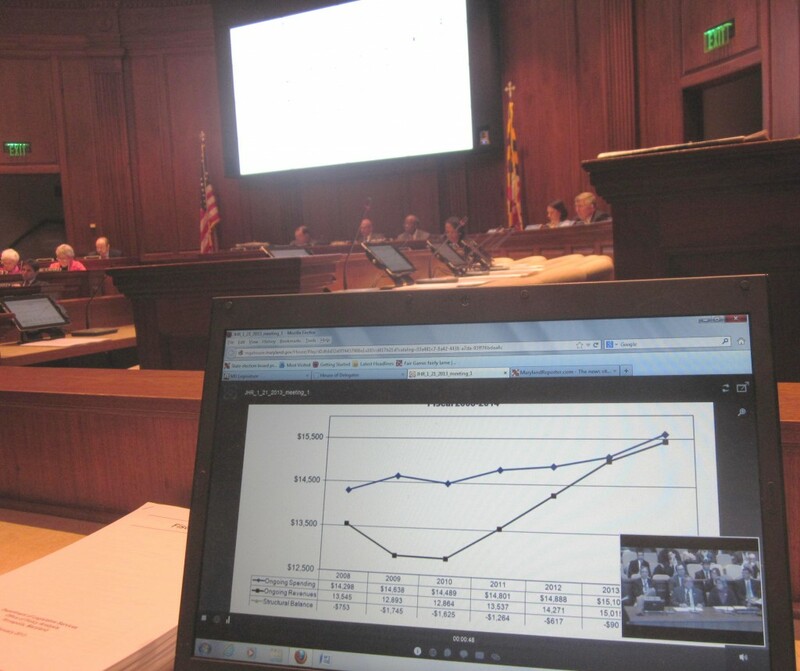 The graph on the new Jumbotron at the front of the Joint Hearing Room is obscured due to backlighting, but both the graph and the testimony is shown being simulcast on a laptop in the foreground. The new improved Joint Hearing Room, wired for video webcasting and a new sound system, made its debut Monday for the annual Fiscal Briefing, the first legislative swipe at Gov. Martin O’Malley’s proposed fiscal 2014 budget. The significance of the new technology is that the Joint Hearing Room in the Legislative Services Building is the largest hearing room in the State House complex, often the scene of large hearings on controversial bills, but it had never been wired for audio and video, as are all the other hearing rooms. The Senate rooms now have only audio, but hearings in the House are simulcast and archived. The shakedown included some whining feedback, rumbling bass and some confusion about microphones, since only one can be live at a time. The Jumbotron (a 12-screen display) didn’t play much of a role, since it displayed the same structural deficit graph for the entire hour-and-20-minute hearing, shown on page 3 of the Department of Legislative Services Fiscal Briefing. You can see the entire briefing archived on the web, though not the first couple of minutes, which is common for Annapolis hearings.